Seaside Book Nook: Super DIaper Baby 2 Review With a Very Embarrassing Story Included!! 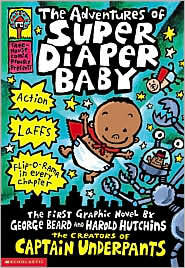 Super DIaper Baby 2 Review With a Very Embarrassing Story Included!! Warning: Do not let your child read this book during church, or they might just say something out loud you wish they hadn't! 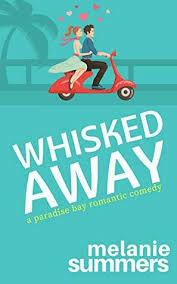 Okay, I will be the first to admit that I sometime (okay all the time) let me kids take a book to read while at church. I know, I know, I know, but hear me out. There are times when they don't have the "children's liturgy" and it makes it very hard for everyone to enjoy mass, especially for the mom breaking up the fighting children and others seated around us. Also, my kids attend a Catholic school and already go to mass weekly. So in order for me to get something out of church (beside my kids not fighting for an hour), I let them bring a notebook or a book. I only let them write in the notebook or read the book during the Homily (goes way over their heads anyway). 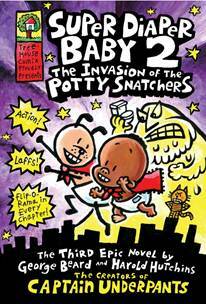 This past Sunday one of the twins grabbed Super Diaper Baby 2, The Invasion of the Potty Snatchers, which we read while on vacation. During the Homily, she said rather loudly, "I love this part, where the evil guy is turned into pee." Not the most appropriate thing to say loudly....in a church.....during the Homily. I have never been so embarrassed. Thank goodness we have an awesome priest and he just kept going, even though there was such an outburst of laughter all around us. I didn't even know what to say or how to react. Besides that, this book really is way too funny. I don't know any child who wouldn't laugh out loud while reading this book. It is all about super heroes (a baby and dog) and evil villain whose cat turns him into pee. The cat turns on the evil villain and the heroes save the day! Any book that has to do with bodily fluids makes my kids laugh and grabs their attention at this age. Yes, I have to admit that I was laughing at parts of this book too. The best part, is my 7 year old twins were able to read it with very little help. I love it when they read out loud and we all enjoy a book. They are so proud of their accomplishments and I get to multi-task! 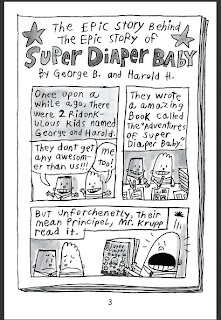 "George and Harold (the co-stars of the enormously popular Captain Underpants series) are in big trouble again! Their mean principal, Mr. Krupp, has had it with their comic books. But the boys aren't giving up, and they decide to create an all-new epic novel about a subject they've never tackled before!" "Dr. Dilbert Dinkle started his career as an ordinary, everyday evil genius/inventor/bank robber. But when he awakens one day transformed into a walking, talking puddle of pee, he vows to destroy every toilet in town. Will the devious Dr. Dinkle and his conniving cat, Petey, ruin restrooms for the rest of us? Or could this be a job for the death-defying, dynamic duo of Super Diaper Baby and Diaper Dog?" "Oh, no! 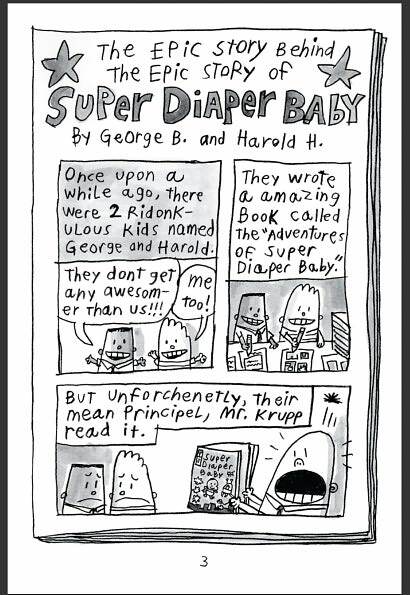 It's not enough that George and Harold have invented Captain Underpants, the greatest superhero of all time, and that they've also saved the world FIVE times-defeating Dr. Diaper, punishing Professor Poopypants and whacking the wicked Wedgie Woman! What task could be worse? As punishment, the boys have to write a 100-page report on "good citizenship," and they have been specifically ordered NOT to write another comic about Captain Underpants. So what do they do? Meet Super Diaper Baby!!!" My kids and I really enjoyed these books and had some great laughs. Even my 9 year old was listening and laughing while the girls read them out loud. My nephew, who is going to be a freshman in high school, and passed his Captain Underpants down to my son, even picked up the two books and read them quickly. He was also laughing out loud while reading! 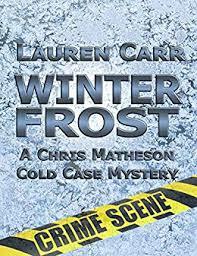 This would make a GREAT summer read too. You can buy Super Diaper Baby 2: The Invasion of the Potty Snatchers ($6.99) and The Adventures of Super Diaper Baby ($5.99) from Scholastic Books by clicking here. Connect with Scholastic Books on Facebook and follow them on Twitter. Would You Like To Win It? Check out Outnumbered 3 to 1, which is a blog that I write reviews for and share craft posts. While you are there entering to win the, see what Mel, Amanda, Ashley, Farrah and myself have going on for giveaways. You won't be disappointed. The giveaway ends July 28th at midnight (EST). Oh how I wish this would have happened at St. Henry's!!! What a riot. Sounds like a book Andy might actually like - maybe I can get him to read something beside the Xbox screen. Heaven is for Real Winner!